and through TwinCreatives, we aim to offer support and inspiration to new writers, as well as explore other bookish things, such as reviews and book hauls. We hope that our advice, experiences and opinions are applicable to your own reading and writing, and will use our blog as a means to share snippets of information that we’ve personally found interesting or helpful. We will also be keeping you updated on our own personal novel writing experiences (both positive and negative!) as we begin our own adventures to becoming published authors. Read below for a little more information about us, our reading preferences and our Works in Progress! 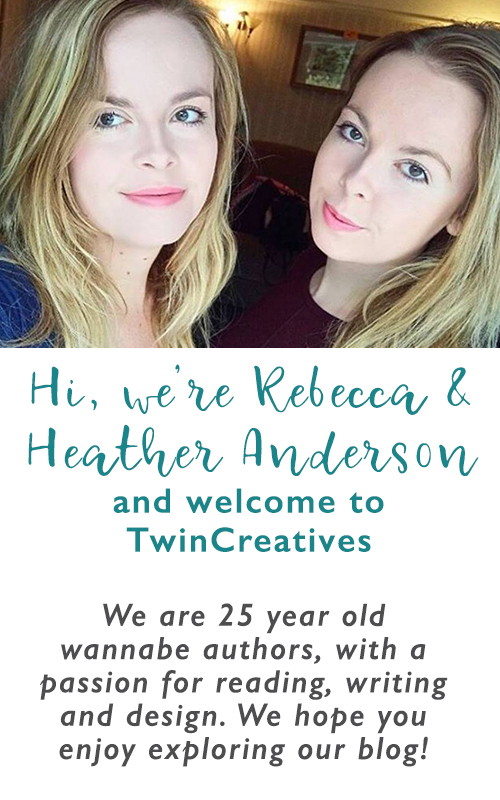 Hi, I’m Heather, a 23 year-old wannabe author and one half of TwinCreatives! My life goals are simple – I’d like to own four guinea-pigs and a Labradoodle and become a full-time author and creative business owner. Aside from reading and writing, I enjoy graphic design, badminton, swimming, going on holiday (that counts as a hobby, right?) and eating. Lots. I’m working on my first ever novel – a young adult adventure / mystery / thriller – and learning the hard way that writing a book is not easy! I chose to write a novel in this genre because I wanted to write a YA novel set against a backdrop imagined and created by me.The idea for my novel came to me one day at work – I was randomly doodling in my notepad when I realised that my sketch would make a cool setting for a novel (isn’t it strange how inspiration can strike you when you are least expecting it). Currently, I’ve written a first draft of roughly 55,000 words, and am 15,000 words into my second draft. I’ve also outlined my novel at least three times so far! Although I like to read a range of books, my preferred genres are thriller and YA, and my least favourite would have to be romance, as I find most romance books too cheesy and samey. I absolutely LOVE the Hunger Games and the Divergent series, and of course, Harry Potter. I also adore Linwood Barclay (I will buy any of his books without even reading the blurb). In terms of favourite book, I would have to say ‘The Beach’ by Alex Garland, which I read recently and was blown away by. I hope that you find my tips and tricks helpful, and I look forward to getting to know some of you, and hearing about your own experiences. Hello, I’m Becca and I am the eldest of the twins. I’ll try and keep this short and sweet so I don’t bore the socks off you. I’d like to think that I am a kind, gentle and funny person who has a lot of empathy towards others. I’m also extremely self motivated whilst somehow at the same time incredibly lazy! I fit my writing around having a full-time job as a graphic designer, a pretty busy social life filled with friends and family and a long-term relationship with Netflix. I am hoping to inspire those who may be in a similar position to me (short of free time but who have a passion for fiction) and remind them that there is always time for writing – it’s all about finding a balance and a schedule that works for you. My taste in reading is very much romance and love stories. Although Heather and I are very similar in a lot of ways, this is one thing that we have entirely different preferences for! I can’t put my finger on exactly why the genre appeals to me – perhaps it’s because a lot of it is easy reading (not needing to decode or read too far into it like you do with some books) and the warm fuzzy feelings that come with the territory of ‘love’. I enjoy reading a variety of different authors – recent names include Nicholas Sparks, David Nicholls, Helen Walsh, Jane Green and John Green. Unsurprisingly, the novel that I am currently working on is a love story (as they say, write about what you know!) but I am hoping to bring a little bit of a twist to it ;). My writing career at the moment is in its early stages – I am currently in the middle of drafting my first ever fiction novel which I am very excited about. I hope it will be the first of many and I have lots of ideas and big plans for the future. I have also dabbled in non-fiction writing – whilst at University I completed a first class dissertation on the legibility of fonts (thrilling, but not as thrilling as Heather’s, which analysed the graphic design of cereal packaging…) and both Heather and I have had an article published in The Ephemerist magazine. As I said before, my full-time career is working as a graphic designer at an agency in Hertfordshire. I have been there for almost 2 years now – doesn’t time fly when you’re having fun? After graduating from The University of Reading with a first (YAY), I had a couple of internships, where I worked mostly for free to gain experience in the industry. Needless to say I was over the moon when I was offered a full time, paid position at such a wonderful agency. Our offices are on a peaceful farm in rural Hertfordshire and I love it. Ideally though, my life goal is to become a full-time author. I get to work on a variety of projects from website design, through to logo design and editorial. In my line of work I have regular experience in the design of online and offline reports, brochures, and books. I am experienced in typesetting, cover design, illustration and photography – all skills that are transferable into the realms of publishing. Thanks for the interest in my blog. I’m happy to return the follow as this is an amazing blog! Thank you so much! Yes please keep popping in. Exciting things to come!! Hello to both of you. As a self published author, it’s always good to connect with people in the world of books and graphic design. I’ll look forward to reading your book reviews and posts about writing, too. Thanks for the follow! What inspires you to write? Thank you for following my blog. I post seven days a week but will disappoint anyone looking for a “how to” type experience. I write for the joy of it and only publish what I think makes enjoyable reading. (Oh, I almost forgot. Posts are hardly ever longer than 500 words.) I hope to see you again and want to wish you the best with your blog and your writing. thanks so much for the comment and for stopping by our blog. To write for yourself and for enjoyment is one of the most important things an author can do. What is the point in writing if you do not enjoy the experience itself? It is also admirable that you post seven days a week – although we both try to write every day, writing something worth posting is much more of a challenge! Finally, although you may not post any ‘how to’ type articles, one can learn a lot from reading other peoples inspiring work, and for that reason we shall be frequent visitors to your blog. Thank you for your kind comments and well wishes, and we wish you all the best for your writing and blog too. I love your blog, especially as you are also based in the UK, which is relatively rare on WordPress writing blogs 🙂 I look forward to reading more from you both! Thank you 🙂 although, I haven’t written it all today. I put my goal up to 57321 because I’d already written some in my document, so 7321 wasn’t from today 🙂 good luck to you too!